I found the car key this morning! I will let you leave your guess in the comment box as to where I found it. Here is a hint: I found it in a place where many things get lost. Tomorrow I will give you the answer. Maybe I can even hand out prizes from the garage sale box I am starting! 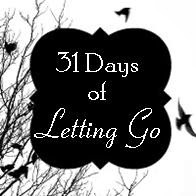 Finding the key was my main success today, Day 3 of Letting Go. I started the day strong with determination to not get distracted and break through any barrier that might get in the way of a really good start with something to show for my effort by noon. I even had a theme song going in my head compliments of The Doors. "Break on through, break on through, break on through, break, break, break....but sometimes it got mixed up with my real favorite on the album which was "Light my Fire" the long version and I began to think that really might be the best way to deal with all this. I knew I had a real problem when the songs in my head led to a search for the CD which in turn led to a search for the album. That's how I ended up on the floor in my closet. From there I took a trip back in time looking at all our old LP's. Can any of you hold those in your hands and not be transported to the time and place you either acquired them or listened to them? I thoroughly enjoyed the journey for just a short while. I realized however, that I am easily distracted. In addition to the closet, the dentist office and grocery store got some of my time today. I even cooked a meal in my kitchen. I guess I need to pick just one room and start again tomorrow this work of letting go. If I can't do better I will get some help. One of my favorite verses in the Bible is Hebrews 4:16-Let us approach the throne of grace with confidence so that we may receive mercy and find grace to help in time of need. I imagine such grace would take the form of a friend who would gently take the LP album out of my hand and tell me to get out off the closet floor and get busy. I would be smiling, though!